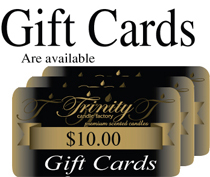 Trinity Candle Factory Premium Scented Peppermint - Pillar Candle - 6x3. 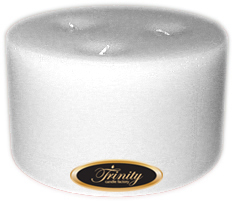 This 6x3 Pillar Candle is premium scented for maximum fragrance throw. With a 150+ hour burn time, cotton wick and premium scent, this candle has 3 wicks "The Original Trinity Candle" and an absolute must. This Peppermint fragrance You will smell the distinct aroma of a Peppermint. This aromatherapy Peppermint candle will help with sinus problems when infused in the air. 100% Satisfaction Guarantee. I was very pleased with the product and the quick shipping.